The problem of determining the optical constants of uniaxial anisotropic crystals by ellipsometry has been studied. In case the optical axis is perpendicular to the surface—true in most of the cleavable crystals and in films where the anisotropy is induced by a size effect—it is practically impossible to evaluate the component Nc = nc + ikc (electric vector parallel with the optical axis) unless the values of n and k are very small. Reasonable values of Na = na + ika can be obtained, regardless of the Nc value assumed. 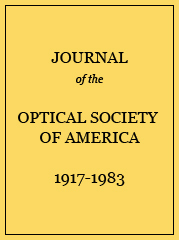 Optical constants of Bi8Te7S5 in air and vacuo.